Turkish police raided the homes of three people Friday and arrested them for insulting President Recep Tayyip Erdogan and other top officials on Twitter. The arrests are the latest in a growing number of such cases, and activists have expressed alarm over the limits on freedom of speech in the country. The three people – two of them women – were identified as Veli H.K., Serpil I. and Serap K. and they were detained at their homes, expected to face court hearings in the coming days, reported the official Anatolia news agency, according to Agence France-Presse. Two were arrested in Istanbul and one in the resort of Fethiye in the Mugla province on the Mediterranean, according to local media reports. The accused allegedly had posted comments that insulted Erdogan, Prime Minister Ahmet Davutoglu, National Intelligence Chief Hakan Fidan, Chief of General Staff Necdet Özel and a handful of ruling Justice and Development Party ministers, according to Turkish news site BGN News. The site also reported that the Turkish National Police had created a new social media task force to identify such offenses on the Internet, and Friday’s arrests were the task force’s first operation. The task force began investigating a pseudonymous Twitter account, “kaan_kursat,” who had suggested in January that people use virtual private networks (VPNs) to communicate anonymously and avoid authorities. The account was eventually traced to Veli H.K., and the other two arrests were users that Veli H.K. was in contact with, according to BGN News. Insulting the president is a crime in Turkey, and many others have faced arrests or jail terms for doing so. A former Miss Turkey beauty queen, Merve Büyüksaraç, faced up to four and a half years in jail for posting a satirical poem criticizing the president on her Instagram account last November, and a 23-year-old student, Aykutalp Avşar, was sentenced Friday to 14 months in prison for calling then-Prime Minister Erdogan a “dictator” during protests in the summer of 2013. Erdogan, who became president last August and was prime minister from 2003 until 2014, has been criticized for being intolerant of criticism. 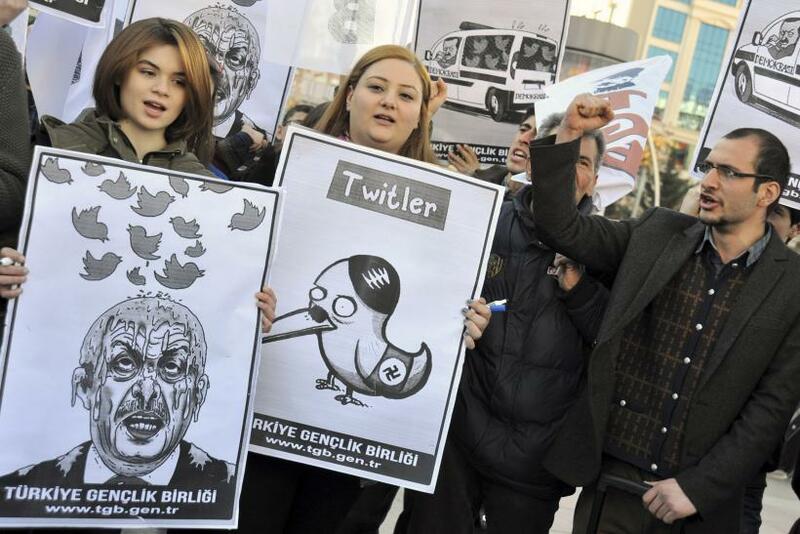 Turkey banned Twitter and YouTube last April after Erdogan vowed to “wipe out Twitter” when users spread allegations of corruption in his office. The bans were lifted a few weeks later when the courts ruled them unconstitutional.